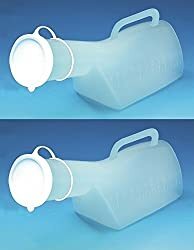 MALE URINAL PACK OF 2 - Urine bottle with long neck, lid and handle - 1 litre capacity. 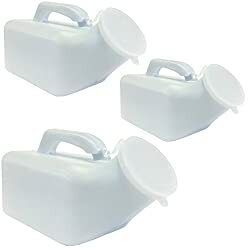 25471 products found in Urinals. Your request for Urinals revealed a total of 625471 results. 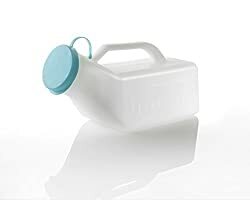 Product Features: 1000ml/1 litre capacity, Secure fitting, snap on cap to prevent leaks and spills and reduce unpleasant odours, Clear, easy to read graduations, Easy grip handling - ideal for those with limited hand movement, Made in Britain, 1 Litre Capacity.